Join the Historical Society of Rockland County as we welcome Christian R. Sonne, the author of Tuxedo Park: The Historic Houses, the first and only book that examines the architecture of Tuxedo Park, a Hudson Valley community forty miles north of Manhattan that normally is not accessible to the public. The gated enclave is famous for its Gilded Age mansions designed by well-known architects such as Bruce Price, Carrere & Hastings, McKim, Mead & White, and Warren & Wetmore. Wall Street Titans, Robber Barons and scions of blue-blooded colonial families made this place synonymous with upper-class living in the first three decades of the 20th century. The tuxedo jacket was first worn there. and Emily Post drew inspiration for her book Etiquette from manners she observed while living in Tuxedo Park. Mr. Sonne will provide a social history of this community from its founding in 1886 to 1945 using many of the beautiful James Bleecker photos from his book, which features 230 photographs of some 60 historic houses. Books will be available for purchase, with the proceeds benefiting the Historical Society of Tuxedo (www.tuxedohistoricalsociety.org). Visit the historic Jacob Blauvelt House on Saturday, December 4, 2010, for an unforgettable day of magic and fun! Join in the celebration! See shoes magically filled with goodies! Hear wondrous and joyful stories! Enjoy holiday refreshments! And meet St. Nicholas and his beautiful horse (courtesy of Diamond Derby Ranch, New City). We're opening the doors to our 1832 Jacob Blauvelt House to welcome children of all ages to celebrate St. Nicholas Day. This traditional Dutch festival is a highlight of the holiday season. Many people who visited with St. Nicholas as children now bring their own families. The Mashantucket Pequot Museum and Research Center is a tribally owned and operated, state-of-the-art complex in Mashantucket, Connecticut. Opened on August 11, 1998, it presents the rich history or the Mashantucket Pequot Tribal Nation, as well as the histories and cultures of other tribes and the region's natural history. The 85,000 square foot permanent indoor exhibit presents four types of interpretation to the visitor: dioramas, text panels, interactive computer programs, and films. A total of 13 films and video programs are on view throughout the permanent exhibit space in 10 locations. The visually impaired are able to move through the exhibits using an infrared communications system and to access audio interpretation, with selected replica artifacts available for all to touch in specially designated areas. The films, computer interactives and videos are close-captioned for the hearing impaired. Highlights of the permanent collection include the Glacial Crevasse, A World of Ice, Arrival of the People, Life in a Cold Climate, Changing Environment, Pequot Village, Arrival of the Europeans, Prelude to War, The Pequot War,. and Life on the Reservation. Price: $75/person. Includes boat transportation and lunch. The M.V. Commander, built in 1917, is listed on the National and State Registers of Historic Places. The Hudson Highlands is rich in natural beauty and history. Henry Hudson sailing up his "Great River of Mountains" called it a very good land to fall with and a pleasant land to see. On this day, our guests were still charmed by the romantic views that inspired the painters of the Hudson River School, who called it the "Rhineland of America." Presented by the Historical Society of Rockland County and the Piermont Historical Society. Sponsored by Beckerle Lumber's Remodeling Showrooms www.beckerlelumber.com. Many friends of the HSRC joined us for our first Fall Family Festival on the grounds around the HSRCand the historic Jacob Blauvelt House.We were also proud to present a music festival within our festival—a Fiddler's Summit that gave our guests a chance to meet, talk with and listen to fiddlers in three Rockland County-based ethnic traditions: Irish, Indian, and Klezmer. Eileen Condon served as the host and emcee. The Fiddlers? Summit was made possible by public funding from the New York State Council on the Arts. In addition, the storyteller Colette Gilbert portrayed Rockland County's legendary "Witch of West Nyack," Naut Kaniff, who shared stories of haunted history in Rockland. Join us for our last summer evening lecture at the Historical Society of Rockland County as Robert Maher, president of the Friends of Rockland Lake and Hook Mountain (www.rocklandlakeandhookmt.org), talks about the history of Rockland Lake and the impact of ice harvesting on the community. 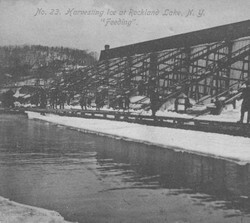 His presentation includes a slide show of postcards and photographs, along with a short movie about ice harvesting much as it was done at Rockland Lake so we can better understand the process. Following the evening's presentation, we invite our guests upstairs to the HSRC's galleries to enjoy our current exhibitions, "Images of Rockland in Photographs & Words," featuring the photographs of Arthur H. Gunther III, and "Rockland Voices," curated by Jessica Kuhnen. Join us for a summer evening at the HSRC as our guest speaker, Arthur Gunther III, reminisces about Rockland. Following the evening's presentation, we invite our guests upstairs to the HSRC's galleries to enjoy our current exhibitions, "Images of Rockland in Photographs & Words," featuring the photographs of Arthur H. Gunther III, and "Rockland Voices," curated by Jessica Kuhnen. Learn about the history of the King's Highway. Part of the very popular Armchair Walking Tour series created by the Rockland historian John Scott, this talk will be presented by Bob Goldberg, who will be available to answer questions. Following the evening's presentation, we invite our guests upstairs to the HSRC's galleries to enjoy our current exhibitions, "Images of Rockland in Photographs & Words," featuring the photographs of Arthur H. Gunther III, and "Rockland Voices," curated by Jessica Kuhnen. Guests on this trip to America's premier folk festival enjoyed the finest in traditional crafts, food, music and folklife. The Kutztown Festival is one of the country's largest folklife gatherings, with more than 200 of skilled artisans demonstrating their traditional crafts. The best examples of Pennsylvania Dutch and early American folk arts and crafts can be found at the festival; most are made on-site for visitorsenjoyment and offer their unique creations for purchase. The 2010 festival had fine furniture, miniatures, pottery, clothing, musical instruments, hand-painted art, iron ornaments, weavings, brooms, baskets, hex painting, jewelry, leather, cut paper art (Scherenschnitte), Pennsylvania German calligraphic writing (Fraktur), beeswax candles and much more. To make the experience complete, bus trip guests enjoyed a full-course, continuously served, all-you-can-eat authentic Amish dinner. Part of the very popular "Armchair Walking Tour" series created by the Rockland historian John Scott, this talk on Nyack Turnpike will be presented by Bob Goldberg, who will be available to answer questions. Following the evening's presentation, we invite our guests upstairs to the HSRC's galleries to enjoy our current exhibitions, "Images of Rockland in Photographs & Words," featuring the photographs of Arthur H. Gunther III, and "Rockland Voices," curated by Jessica Kuhnen. Price:: $175/child per week ($150/child per week for HSRC members). Includes all supplies and a mid-morning snack. Travel back in time. Span a week (or two!) and discover a simpler time. Held on HSRC?s beautiful grounds, which includes the historic Blauvelt House, barns and gardens, our Old-Fashioned Summer Day Camp presents something new each day. Activities include candle dipping, creating historic toys, playing Native American games, and simple but fun diversions that entertained young folk in the 1830s. At the end of each week we have an old-fashioned picnic featuring hand-cranked ice cream and churned butter, cornbread and salad made from vegetables growing in the Blauvelt House garden! Price: $109/person ($89/person for HSRC members) Includes luxury bus transportation, a private Emily Dickinson experience, a gourmet Abigail Kirsch buffet luncheon and an all-garden pass. This very special daytrip visited "The Poetry of Flowers: Emily Dickinson's Garden" at the New York Botanical Garden. With a private tour guide, our group experienced the life and works of one of America's most treasured poets that included a private tour of her Victorian Homestead re-created in the Conservatory filled with tulips, lilacs, lilies and more, before strolling the garden paths and reading some of Dickinson's most famous works. This special event was co-presented by the Poetry Society of America. Guests dined on a fabulous Abigail Kirsch buffet lunch in the dining room overlooking the garden. Our all garden access pass allowedthem to visit the rest of the gardens ontheir own -- they were free to hop-on the tram to visit the Rose Garden the Children's Garden or any other area that suits them! Find out more about the history of the area where you live. Join us as we focus on the early 1800s and how the Pennsylvania coalminers transported their goods to where the population lived. The Hudson River Maritime Museum is the only museum in New York State exclusively preserving the maritime history of the Hudson River, its tributaries and the industries that depended on the river. Founded in 1980 by members of the Steamship Alexander Hamilton Society, the National Maritime Historical Society and local historians, the museum is located in the Historic Roundout waterfront at Kingston, New York, once the major port between New York City and Albany. The D&H Canal Museum provides insight into the 108-mile long, four-foot deep, 32-foot wide waterway. Navigation of the full-length of the canal began in 1828, and the canal operated until 1898. During its construction, small towns and villages and a variety of industries sprang up along its route. The opening of the canal in 1828 proved to be the beginning of a new era for New York's Ulster County, transforming the area in size and economic development. We will visit a working farm in Accord, New York, and enjoy a delightful buffet luncheon at Hillside Manor, the premier choice for fine dining in Ulster County and the Hudson Valley for more than two decades. Whether you're just beginning to research the history of your family, your house or the community that you live in or you have many years of research under your belt, we hope that you will join us on April 17 when we welcome Peter Scheibner, Rockland County's Archivist, to the Historical Society of Rockland County. As part of one of our current exhibit, "Why Archives Matter," a traveling exhibition developed by the Upstate History Alliance that was in one of our museum galleries through May 9, 2010, Peter described our county's archives and how they work. Deeds, census records and other important topics were discussed. Peter J. Scheibner, Rockland County Archivist, was a recipient of the 2008 Rockland County Executive's Historic Preservation Merit Award for Preservation Leadership. The HSRC was proud to celebrate the 40th Anniversary ofthe acquisition of the Jacob Blauvelt House. Honored at this event were Erin L. Martin,Jeffrey Keahon, and John Blauvelt Gibbons, with a special tribute toThomas F. X. Casey. The evening included a silent auction, a live auction,a cash raffle,dinner, music and a delicious dinner. A great time was had by all. Participants were treated to a spring delight when they join us for a terrific day of enjoying the best that the Hudson Valley has to offer. The trip started with luxurious dining at the Culinary Institute of America'sEscofier Restaurant, featuring the meals created from the bountiful harvests of Hudson Valley's best farms.The tour then continued to Dia:Beacon, opened in May 2003 by the Dia Art Foundation as a museum to house its renowned permanent collection of major works of art from the 1960s to the present. Located on the Hudson River in Beacon, NY, Dia:Beacon occupies a nearly 300,000 square-foot historic printing factory -- a former Nabisco(National Biscuit Company) box printing facility built in 1929 and designed by Nabiscos staff architect, Louis N. Wirshing, Jr.. The galleries are named in honor of Louise and Leonard Riggio for their extraordinary generosity, which has helped make possible the realization of this museum. The building's most recent owner, International Paper, donated the property to Dia in 1999. The cost included luxury bus transportation, gourmet luncheon and the tour of Dia:Beacon. Hops and History on the Hudson: Luncheon Cruise on the Historic M.V. Commander! The M.V. Commander, built in 1917, is listed on the National and New York State Registers of Historic Places. The Hudson Highlands is rich in natural beauty and history. Henry Hudson sailing up his "Great River of Mountains" called it a very good land to fall with and a pleasant land to see. On this day, our guests were still charmed by the romantic views that inspired the painters of the Hudson River School, who called it the "Rhineland of America." The fall foliage was at or near peak. A great group of HSRC members and supporters spent a beautiful fall day celebrating Rockland County History Month on the majestic Hudson River! The cost was $ 75. per person, which included a delicious lunch, good conversation and a chance to relax and watch the fall foliage. The Philadelphia International Flower Show is the oldest and largest indoor show of its kind! Produced by the Pennsylvania Horticultural Society and presented by PNC, the 2010's presentation "Passport to the World" celebrated the exciting landscapes and plants of China, Japan, Thailand, England, Scotland, Ireland, Germany, the Caribbean, and an artful perspective on the northern polar region's Aurora Borealis. Daily musical performances on the Explorer's Stage included classical and contemporary Indian dance led by celebrated Bollywood choreographer Rujuta Vaidya, and music and dance presented by the vibrant Brazilian troupe, Minas. The $ 89. cost included luxury bus transportation, admission to the Flower Show and a delicious luncheon at the historic City Tavern. When: Saturday, February 27, 2010, 12:30 p.m. to 3 p.m.,author's reading at 1:00 p.m.
Elizabeth will read from her upcoming book, The Very Little Princess, scheduled for imminenpublication earlier that same week! Elizabeth's books are available for purchase at the HSRC's Museum Shop -- a great way to show you're a supporter of Elizabeth's work and of the Historical Society of Rockland County. Admission to the current exhibition is $7 for adults; $ 3 for children age 12& under and includes this author's event. Our current exhibition is our very popular 34th Annual Miniature and Dollhouse Show -- A Serendipity!- -- which runs through Sunday, February 28, 2010, two museum galleries full of beautiful pieces by very talented artists and craftsmen, includes many of Elizabeth's beautiful illustrations. Price: $10/person, which includes admission to The 34th Annual Miniature and Dollhouse Show: ASerendipity!